The lessons are divided among two units that when completed together, will give students a thorough understanding of how population growth and individual actions impact both people’s lives and the natural world. Each unit or individual lesson plan can also be used separately to complement classroom instruction throughout the school year. The lessons are divided among three units that, when completed in sequence, will give students a thorough understanding of basic demographics and the environmental and social issues facing our growing population. The units or individual lesson plans can also be used separately to complement classroom instruction throughout the school year. All are adaptable for middle or high school classrooms. Exploring how people impact the Earth – both the natural environment and our global family – is a must for today’s students. We live in an increasingly interdependent world where all of our actions matter. The choices today’s students make about the food they eat, the things they buy, the way they treat their neighbors, etc. – will have a collective imprint on the future. Inspire your students to make positive choices and take beneficial actions as they become tomorrow’s leaders, voters, and parents. The “Our World, Our Future” activity guides are designed to cover themes of sustainability and global citizenship through hands-on, memorable classroom activities. The interdisciplinary nature of these topics makes the lessons appropriate for use in any of the core subject areas (science, social studies, math, and language arts). Spanish is the second most common language on the planet and the first language of many students in the United States. 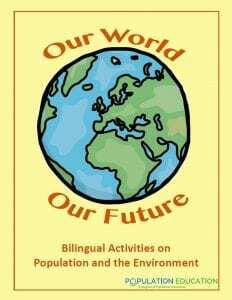 The contents of the “Our World, Our Future” activity guides are available in both Spanish and English to provide teachers and students with maximum flexibility based on students’ proficiency in either or both languages.